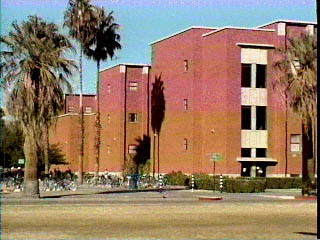 NACCL-14 will be held in the Modern Languages building near the center of the University of Arizona campus. It is a pleasant 10-minute walk from the Four Points Sheraton hotel, and there is parking available nearby in the Second Street Garage if you choose to drive. Below is a partial campus map, showing the location of the Modern Languages building in red; and in blue, suggested walking routes from the Four Points Sheraton and the Second Street parking garage to the Modern Languages building. Two nearby on-campus eating places are shown in green. The conference sessions will be held in classrooms at the south end of the Modern Languages building, on the main (3rd) floor. It is most convenient to enter the building through the covered breezeway, from either the east or west side. The rooms to be used for the conference are shown in blue. Registration and coffee will be in the hallway near Room 310 on Friday morning.